During this World Economic Forum session entitled “A brave new world” embedded below, Stuart Russell mentioned at 24:30 that with autonomous vehicles, the need for parking spaces and taxi drivers will be reduced. Some ideas for cities that want to become more bicycle friendly. What would you add? Reading this article and this article, I learned that Hamburg is working on a plan that, over the next 15-20 years, is going to expand the number of green spaces considerably. The hamburg green network will connect parks, recreational areas, playgrounds, gardens, and cemeteries through green paths. These changes are not least being made, as I have understood it, to respond to environmental changes such as increasing temperatures and sea levels and – more generally – to make the city a healthier and more pleasant place to live. Digital technologies contribute to changes that are going on in the way people get from a to b. Via betahaus hamburg, I learned, for example, about citeecar. What I like about the solution of citeecar is, for example, that it is simple to understand – and a relatively inexpensive transportation solution. In short, it seems to be a carsharing solution for the average joe. Studying other transportation innovation initiatives around Hamburg, I also found out that by using the hvv mobile app you can actually save money when you buy your ticket online. And I learned that in Hamburg, transportation by bicycle is being upgraded in priority – as this nexthamburg idea also suggests. For example, I was quite impressed by StadtRAD Hamburg, a very well developed bike sharing solution that enables people to pick up and leave bicycles at any StadtRAD Hamburg station that are situated – quite close to each other – all over city. The StadtRAD Hamburg bike sharing solution is, I noticed, very popular among the local population. Lots of people use the bikes to get from a to b. What I found great, for example, was the very good quality of the bikes and also, that within the first ½ hour of a rental, you use the bike you rent for free. In addition, I liked the very well developed bicycle streets in Hamburg that, as you can see from the photo below, are painted red. 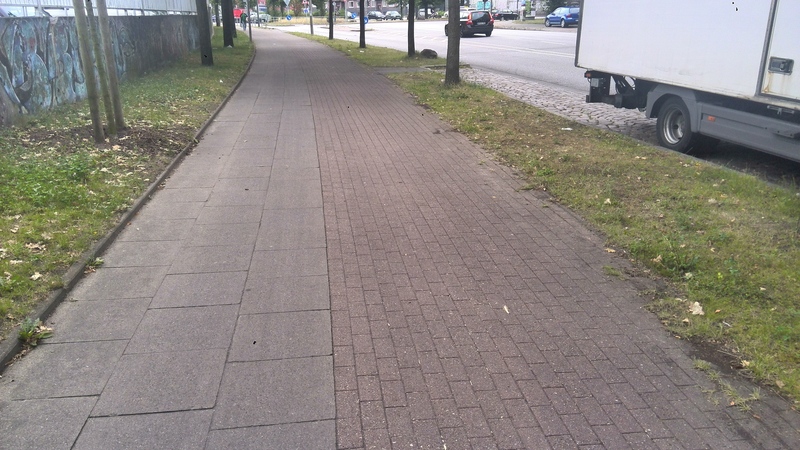 On the photo, the bicycle path is the right part of the sidewalk. Want more inspiration on the topic? Then take a look at this presentation about bicycle friendly cities And in this work on transportation innovation I have tried to pinpoint some further, broader changes going on in the transportation / mobility space. Have a good time getting around. An update to a little book about Switzerland.